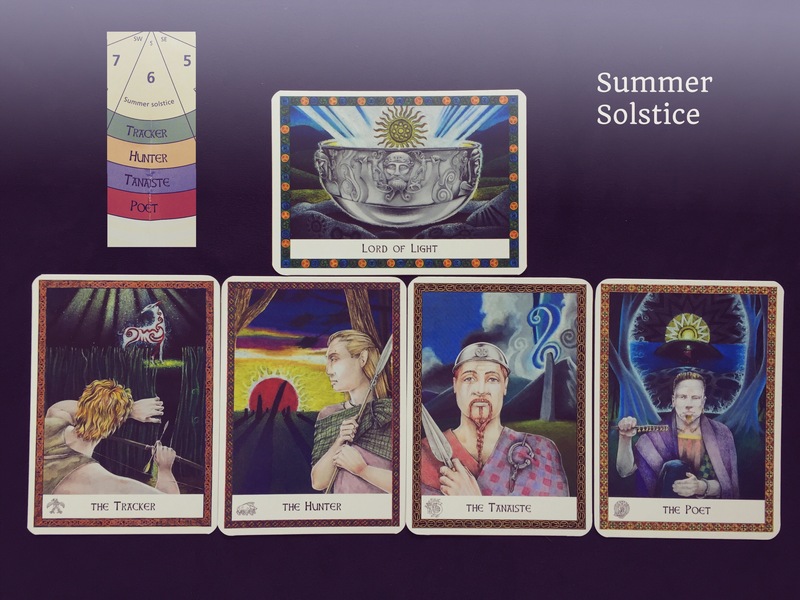 Summer Solstice: Time to Celebrate! The Solstice this year comes on the 21st of June, it is time of the greatest daylight and the shortest night in the Northern hemisphere. The triumph of the light! To many cultures, the Solstice represents a turning of the year, a culmination of something. I am intrigued to study the ancient Celtic culture and what the ancestral footprints tried to teach us in the turn of the season’s cycle. Using The Celtic Wisdom Oracle to offer a general reading for the season ahead, the mythic Lord of Light overseas this creative cycle. The Lord of Light helps us to see with clear vision, enabling us to be strong and resourceful. Think of him as Manawyddan in Welsh mythology. He is the second husband of Rhiannon. He opens up skilful ways of surviving when he and his family are removed from his own land. He creates goods that can be traded, uses his skills to release his wife from enchantment. He comes to pose questions to you for this season: for what are you most grateful? How can you serve the common good? The clan cards depict some of the commonly shared human ancestors of our bloodlines. In the Celtic world the 4 clans are farmers (Clan of Truth), warriors (Clan of Honour), rulers (Clan of Sovereign) and ‘the people of the art’ like druids, poets and healers (Clan of Wisdom). Overseeing summer are all young adults of the clans, representing a robust and growing energy of the time. The Tracker from the Clan of Truth: he is exemplified by the young British hero, Culhwch, who is set 39 impossible tasks before he dare to claim Olwen, the giant’s daughter, as his wife. He reminds us the virtue of perseverence and to seek assistance from those who support you. The Hunter from the Clan of Honour: he is exemplified by Diarmuid, a trusted warior of old Irish war leader Fionn mac Cumhail, yet he eloped with his beautiful wife Grainne. He is thus torn between his Lord and the woman he loves. Because the couple are living in the wild he has to hunt daily for their food. He reminds us summer is not the time to hold back because of fear of breaking conventions. Stepping outside the boundaries may give you new freedom to operate. The Tanaiste from the Clan of Sovereignty: he is the heir-apparent elected by the tribe’s elders to avoid disputed succession in time of war. Naturally his duty is to serve the will of the tribe and the need of the land. He reminds us that summer is the time of service when your gifts can be used at last! The Poet from the Clan of Wisdom: with his songs he awakens and sustains memory as well as bring inspirations to the clans. His wisdom comes from his initiation by the Welsh enchantress Ceridwen with her famous cauldron of knowledge. He advises us the importance to nourish our soul, mind and heart with whatever brings us inspirations. Learning from the Celtic wisdom, summer is a time to move forward with perseverence and without fear. Use your gifts to bring harmony where imbalance has ruled over too long. Connect yourself with whatever feeds your soul, so that your heart will be refreshed with inspirations. Make good use of time. Have a wonderful and vibrant summer! This entry was posted in everyday, Magick and tagged celtic wisdom oracle, cycle, season, summer solstice on June 20, 2015 by The Magician.